Should Copts in US come out to welcome Al-Sisi? Egyptian Copts in the diaspora of New York and New Jersey must decide to obey a call by Orthodox Pope Tawadros II of Egypt for a NYC rally at the UN General Assembly in support of President Al-Sisi’s speech on September 20. An official statement by the Coptic Church indicated that Bishop Beeman of Nakada and Qus and Bishop Yuanis of Assuit were sent to the US to arrange and promote Coptic crowd support prior to the president’s arrival. The reaction of Copts to this idea is split, and the issue is complex. Statements coming from Bishop Beeman in New Jersey last week accused Copts of causing 60 percent of sectarian violence in Egypt by their insubordination within the church community, offering no explanation or references. Copts are angered and disappointed to receive this criticism and view it as pressure to perform. Makrius Saweres, priest of the Saint George Church in Jersey City, is demanding that all Copts in the tristate area gather to welcome Al-Sisi on the sidewalks near the UN, warning that, “any wrong doing on the part of the Copts in America [during this event] such as insulting or minimizing the role of the president will reflect on Copts in Egypt.” By this he meant that Copts will pay a dire consequence, as usual, in their Egyptian home towns if they speak their minds. Showing up at all to gather as religious authorities suggest is risky business given the possibility of Muslim Brotherhood gangs doing the same... Many might rather protest against Al-Sisi with this opportunity, but such a timely reminder of violence back home is now an effective muzzle. Furthermore, showing up at all to gather as religious authorities suggest is risky business given the possibility of Muslim Brotherhood gangs doing the same. 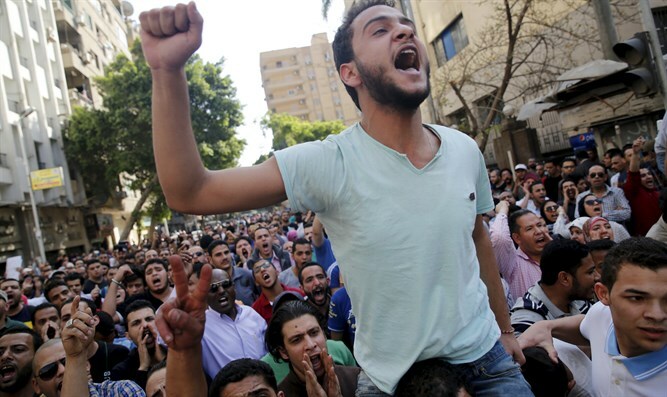 This could lead to a direct clash between Copts supporting Al-Sisi and Islamists against him. We can’t ignore that Egypt’s Islamists (MB and Salafi) consider Copts behind the fall of Morsi’s regime. Should conflict here take place it could in turn lead to copycat clashes in Egypt. Various potential scenarios in New York could bring sectarian ramifications to Copts in Egypt. Once again, Coptic religious leaders conspiring with the regime in Egypt score political points on the backs of their people. The Coptic community inside or outside of Egypt never delegated their spiritual leaders as political spokespersons. But this is not new to Copts who were once discouraged by US Coptic Church leaders on orders from Pope Shenuda from protesting against the former Egyptian President Mubarak during his visits to the US. The “alliance” between Shenuda and Mubarak can now be similarly seen here between Tawadros II and Al-Sisi despite Tawadros’ promise upon his installation to be hands-off of political issues, which admittedly are outside of his role. Mobilizing Copts in support of Al-Sisi’s UN General Assembly speech focusing on international issues and not the internal affairs of Egypt has no relevancy. There is absolutely no gain by it except for the power gained by Pope Tawadros II in his political maneuvering, which unfortunately does not calculate for the safety and well-being of his people.